Let’s have a conversation about edges. For some naturals, they can present a challenge, to put it mildly. Edges must be “laid”, which is just another term for styling. If any celebrity or well-known person shows up with untamed edges, you’ll get everyone’s opinion about it, as Olympic gymnasts Gabby Douglas and Simone Biles, sadly, found out. Here’s the thing: it should go without saying that women can wear their hair and their edges any way they want to. However, it’s okay to be concerned about how your edges look because certain hairstyles indeed draw more attention to that area. Just keep the concern on your own head. So, why do edges seem to have a mind of their own? Why are they so sensitive? Why do the textures vary so much from the rest of your head? And while edges are typically fine, hence the sensitivity, sometimes they can be quite coarse. What is up with that? Is your hair regimen completely failing you? First, just like there can be varied textures on different parts of your head, your edges can have different textures as well. It’s totally normal. But whatever texture your edges happen to be, always keep them in good shape before thinking about ways to tame them. Watch Halfrican Beaute as she shares how to safely lay type 4 natural hair baby hairs/ edges by using jamaican black castor oil & gorilla snot edge control. Looking for the right edge product will involve some experimentation because one thing doesn’t work for everyone. And if your edges are coarse, it’s an even deeper challenge. But don’t let that tempt you to do something you might regret later. Starks recommends temporary solutions, i.e., something that can be easily reversible, such as leave-ins, gels, or a low-setting blow dry after putting in product (but don’t do it often). Another solution? Just let your edges be. Even if you forego relaxing, sometimes doing too much with styling products can cause damage as well. The fixation on edge control could end up being more trouble than it’s worth. Whatever you decide, Starks emphasizes doing your own research and being extra wary of anything that looks good on camera. 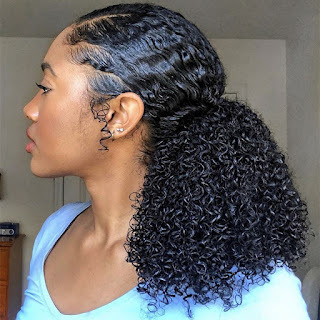 Some of our most popular products for styling edges include Eco Styler gel, Design Essentials Honey and Shea Edge Tamer, The Mane Choice Laid Back Effortlessly Growth Stimulating Edge Control, CURLS Blueberry Bliss Control Paste , and Mielle Organics Flexible Hold Edge Control. How do you lay down your baby edges?